Woodlands Family Theme Park near Dartmouth is celebrating the start of the 2016 season with a unique offer for the park. 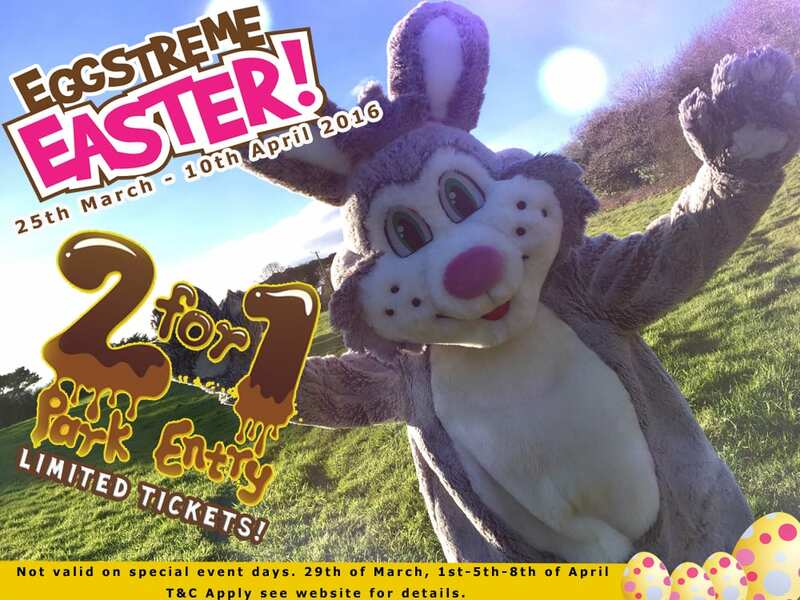 The family run attraction, which is now in its 27th year of opening, is offering their guests an unforgettable chance to grab 2 for 1 tickets for park entry for the Easter Holidays. Woodlands Family Theme Park had a brilliant year in 2015, seeing guests flock to the park to enjoy all the fun, rides and attractions on offer. Park Director Pat Bendall said “we want to continue seeing everyone enjoy themselves in the park and really make 2016, a year to remember”. The 2 for 1 offer is a first for Woodlands who have never had an offer like this before. Marketing Executive Jessica Bennett said “this offer is a first for us but we wanted to start the season off with something extra special for all our guests. We are very excited for this year, we had a record breaking February Half Term with more guests visiting us than we’ve ever had before at this time of year and want to continue making 2016 a fantastic year for everyone”. This year Woodlands Family Theme Park is introducing 2 new attractions which will be opening during the year. The first to open will be a brand new Dinosaur experience which is like no other, then later in the year guests can test their jumping skills on the incredible Jumping Pillow. “We are looking forward to announcing more information regarding our new attractions and our new events soon. It is our most exciting year yet and we hope everyone who visits us has a fantastic time” Jessica continued. Be quick with the Special Offer though, the 2 for 1 tickets are only available online and are limited so when they’re gone, they’re gone! The park is open over the Easter Holidays 25th March – 10th April, the 2 for 1 tickets are not valid on the special event days which are 29th March, 1st, 5th & 8th April. The terms and conditions for this offer can be found on www.woodlandspark.com. If you’re quick you could be visiting Woodlands this Easter for only £8.55pp or less. With all the amazing Easter activities including the UK’s No 1 Easter Grotto and their famous Easter Egg Hunt it’s the perfect day out for the family this Easter. For more details on the offer or to book your tickets for Easter 2 for 1 special visit www.woodlandspark.com.